Wanted to share a few of my favorites from our own photoshoot of Allison’s hamburger shoes. The simple retro atmosphere of the local Five Guys provided such a perfect backdrop that for a brief moment I could have sworn the shoes were born there on the grille instead of back in my studio. I don’t think the busy line cooks really cared or understood what we were taking pictures of, but the shoes attracted plenty of interest from surrounding patrons. 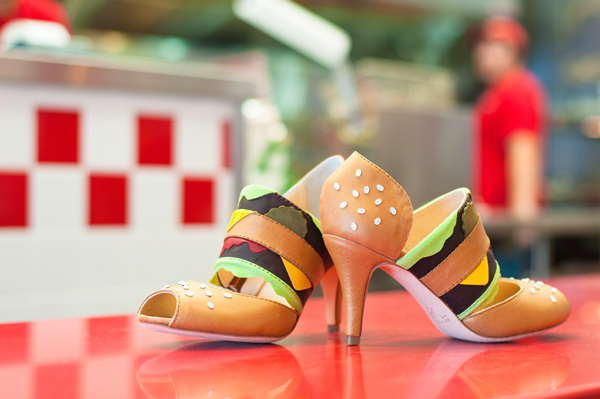 Even I have to admit this is the first pair of shoes I’ve seen that look good enough to eat (I’ll have to make a dessert-themed pair next)! Learn more about the story behind the shoes here and then view them in the Gallery!